Originally found at the site of a meteor impact, moissanite is truly a gem out of this world. Furthermore, it has undergone an incredible journey to become one of the leading diamond simulants on the market today. Follow along as we explore the incredible impact this young gem has left. Compared to many other gems, moissanite is a relatively recent discovery. It was first identified in 1893. Dr. Henri Moissan is credited with its discovery. He came across this new crystal while collecting samples from Canyon Diablo, Arizona. This area is home to the Barringer Crater, a site of great geological importance. This is because the meteor impact is so well preserved in this location. Initially, Moissan believed that he had found diamonds of a green to black-green color. These tiny crystals were contained in iron fragments from the Canyon Diablo Meteorite. It wasn’t until further analysis was conducted that the possibility of a new find was considered. By 1904 he had identified his discovery as silicon carbide. Moissan’s work later in life was spent trying to recreate this mineral. After his death, it was renamed moissanite to honor his work and contributions. To this day, natural moissanite is an incredibly rare mineral to find. Parallel to Moissan’s discovery, and unknown to either man, Edward G. Acheson was working to synthesize diamonds. In fact, just a few years earlier Acheson succeeded in producing his first synthetic sample of silicon carbide in 1891. He called this synthesized material carborundum. Most noteworthy, the same year that Moissan made his discovery, Acheson received his patent for his synthetic carborundum. These early specimens were intended for use as an abrasive and cutting material. Consequently, it wouldn’t be for many years that we would see moissanite of gem quality offered. Cree, Inc. is an electronics manufacturer who pioneered the refinement of silicon carbide. Their work resulted in a very pure material suitable for lapidary use. As a result, by the late 1980’s they were able to synthesize pure crystals of this mineral. A co-founder of the company, Eric Hunter, recognized its potential as a diamond simulant and created a new business to begin marketing, producing and selling this synthetic gem. This company was Charles & Colvard. 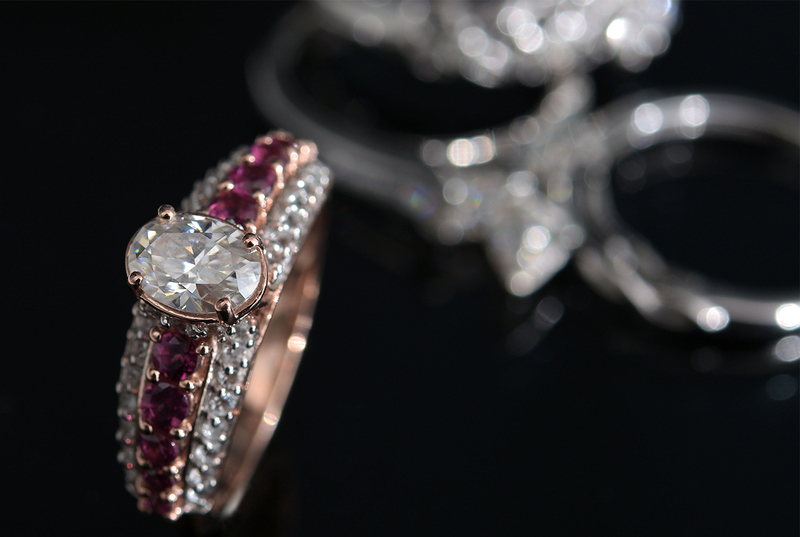 Due to their exclusive patent, they were the sole supplier of moissanite for many years. They produced several varieties, including one comparable to the best colorless diamonds. Early moissanite gems were nearly colorless in appearance. Despite some very faint color seen on larger specimens, they proved to be an immediate hit. The popularity of the gem climbed as new varieties were developed. The best quality material is now completely colorless in appearance. 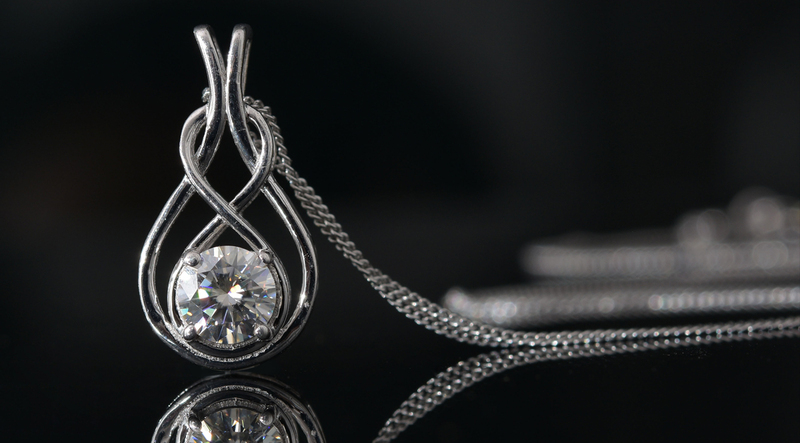 A key factor of moissanite is its dispersion. Dispersion is the technical term to describe a gem’s fire, or how it disperses light. Because of its incredible fire, it is renowned among diamond simulants. Compared side-by-side, it’s dispersion is 2.4 times that of diamonds! The synthesized material is also incredibly durable. Ranking 9.25 on the Mohs scale, it falls just below diamond. It is extremely resistant to breaks, chips, and scratches. Due to this, moissanite makes an excellent choice for an everyday wear jewelry piece.